There are 20 reviews for this breed. W e have had three Irish Setters over the last 29 years. Our first setter was a rescue dog who was about 5 years of age. Our second had been in a car accident and came to live with us when he was three and then Corrigan joined our family as a puppy and is now in his ninth year. An Irish is everything anyone would want in a pet. They adore children, are fun loving and are great to come home to. They are very kind and generous with their affection while at the same time very protective of their family including the cat and the mailman (No !). We have loved our Irish Setters just as much as they have loved us and feel very privileged to have had them in our home over the years. Very intelligent, they have an instinct for danger and an instinct for unscrupulous people and will protect children or its owner. Great bird hunters. Great temperament and very loyal. Dog friendly unless another dog is aggressive towards children or owner. 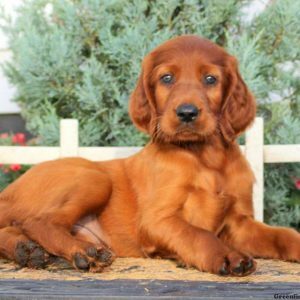 If you own and love an Irish Setter,this breed will lay down its life for you. Very easy to train, yes I have owned an Irish Setter and wish I was young so I could own another one. They need to run. I recently lost my best friend and constant companion of the last 10 years. Her name was Ladybird,and i can only describe her as extremely intelligent,a bit silly,and very loyal. This dog, simply put touched the hearts of everyone who came in contact with her,at this time she is sadly missed,but will never be forgotten. My rating for her is way above your normal 5 star. Great dog. Bought an Irish Setter at 1.5 years old and had him for 10 years. I am on my second Irish Setter. This is an amazingly sweet breed and great at hunting. They are fun and oh so loving. Most dogs are loving but the Irish Setter takes it to the next level. Hyper puppies. But once past that..Amazing. Our Irish, Grady, had the sweetest disposition and was so loving. He loved to hunt birds with my husband. I want another one. He was a perfect companion. Most dedicated loyal friend. Kind with children. Sensitive noble and so beautiful. I had a three females.One named Apple. Red nose and dainty.as could be. Aurora was the next one. Beautiful puppy I had to give up when transverring from Germant to states. Went out and bought another Apple. I love them. The Irish Setter is a unique and beautiful dog. 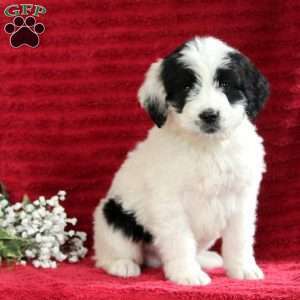 This breed was developed in Ireland in the 1700’s from a combination of Irish Water Spaniel, Irish Terrier, English Setter, Pointer, and Gordon Setter. The Irish Setter is considered a bird dog, used for finding, pointing, and retrieving birds. They have a particular way of doing this called “quartering”, where they run in a zig-zag pattern in front of the hunter in order to find the scent of the birds. This dog makes a great family pet, as they are very affectionate, loving, and devoted to their owner and family. They were recognized by the American Kennel Club in 1878. An interesting fact about this breed, at one time, the Irish Setter had a red and white coat, but was selectively bred to produce the mahogany coat they are recognized by today.